The Tennessee Titans return back to Nashville, Tennessee to take on the Cleveland Browns this Sunday in a game they need to win. The Titans have now lost three games in a row after starting out strong versus the Kansas City Chiefs in Week 1. The Titans then went on to post terrible performances against the Dallas Cowboys, Cincinnati Bengals and Indianapolis Colts. The Browns are coming off a bye week and are relatively healthy. They are also the only team in the league that has yet to turn the ball over this season. The Titans on the other hand have turned it over seven times so far. One of the big keys in this game will be limiting mistakes and it seems the Browns have the edge in that regard. Shoutout to @ThePredatorial for the stat. Am I right that the Browns are the only NFL team that hasn't turned the ball over this year? @SportsbySharona yes mam! #1 in the league, #1 in your hearts! The Titans will have Jake Locker back and all eyes will be on the young quarterback. This is a big game for the Titans. Locker needs to get the offense going and the team needs to put an end to its losing streak. There is no evidence to suggest this team can recover from a four game losing streak. Locker isn’t the only one who must play better. The entire offense particularly the offensive line must do better. The wide receivers must step up and start making plays. The Titans longest designed run of the year is a 20 yarder by Shonn Greene against Cincinnati in Week 3. It would be nice to see something cooking in the run game. This is an ideal game for the Titans to finally establish something on offense. The Browns rank 27th in the league in opponent passing yards and 29th in the league in opponent rushing yards. The Titans need some long drives to help their defense and to get some rhythm going on offense. Tight ends Delanie Walker and Taylor Thompson have battled injuries the past two weeks but Walker has yet to miss a game. He was limited in practice Thursday but should play Sunday. Thompson did not practice and is unlikely to play against the Browns. 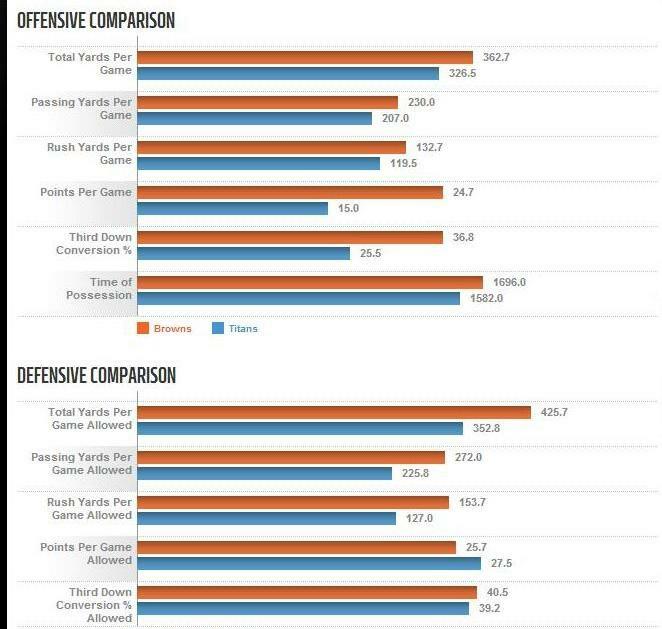 The Browns offense has been rather efficient under Brian Hoyer and they are better on offense than the Titans in every category. The numbers are particular better in points per game, third down conversion, time of possession and yards per game. They are averaging a very respectable 425.7 total yards per game. The Titans are likely to see a running back committee of Ben Tate, Terrance West and undrafted free agent Isaiah Crowell. Crowell is the goal line back and has punched it in three times. West has added two more rushing touchdowns of his own. The Titans run defense has been so bad teams have opted to run the ball against them leading to a misleading statistic on their secondary. Going into the Week 4 game against the Indianapolis Colts it had been ranked second in the league in opponent passing yards. Browns running backs must be chomping at the bit to face this unit which is allowing 127 rushing yards per game and that has given up five rushing touchdowns. The Browns are without standout wideout Josh Gordan until Week 11 but Andrew Hawkins and Mile Austin have been pleasant surprises. Hawkins has 21 receptions for 244 yards while Austin has tacked on two touchdowns. The Titans are expected to be without struggling second year cornerback Blidi Wreh-Wilson who is sidelined with a concussion. Rookie Marqueston Huff could start in his absence in the slot while the Titans move Coty Sensabaugh outside. The Browns have had more opportunity and success in the return game and it remains to be seen if the Titans special teams can get their offense get good field position by establishing something there. Their return game has been nonexistent and it would be nice for them to set up a short field for the struggling offense. Coverage units continue to be average at best though so far they have not given up a special teams touchdown. Going back to their days as the Houston Oilers the Titans have faced the Browns 62 times including one post season game. The Browns have won 33 games and the Titans/Oilers have won 29. The Oilers and the Browns faced each other in the AFC wildcard game on Christmas Eve in 1988 with the Titans winning 24-23 in Cleveland. The game will be broadcast on CBS with the play by play handled by Andrew Catalon alongside analysts Steve Tasker and Steve Beuerlein. Gene Steratore and his crew will handle the officiating duties. The weather is expected to be mostly sunny with a high of 73 and a low of 53.